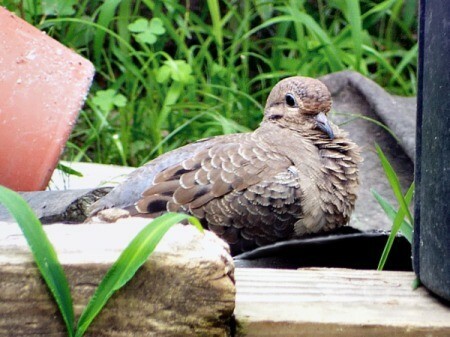 When I first spotted this bird, I thought it was a Mourning Dove. Then I realized something was rather strange. It must be some type of pheasant. But no, the way it was walking, the way it was feeding, I decided I was right the first time. It was a dove. For reference, compare this picture to another I posted of a 'normal' dove. You can readily see many differences. The picture is here. 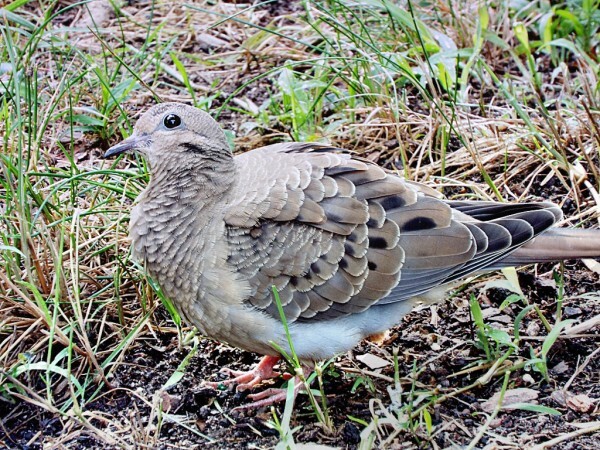 First, this strange dove does not have the characteristic 'blue eye shadow', and its head and bib are mottled rather than monochromatic. Its allover color is more of a blue grey, and while missing the blue eye shadow, it does have a faint blue patch at the rump. The wing feathers are much shortened, having a blunt effect with rounded tips. The four distinct roundish black markings on the wings have been replaced with several markings scattered about the wing tips. I probably would get a chuckle or two from an ornithologist if I showed him my 'Mystery Dove'. Its features may be as common as mud. All I can say is 'I have observed Mourning Doves all my life. I have even raised them. I have never seen a mourning dove with such 'unusual' features'. mutant, he doesn't know it, and his fellow doves don't know it. Another good reason this bird should be, and is, a symbol of peace. Now, I am inside at the kitchen window. It watches my every move from fifty feet away. I haven't seen it fly. I don't know that it can. If it has a mate, I haven't seen it. Such a nice bird, but it seems so lonely. I've since learned that this bird can fly, although it seems to prefer not to. It has made my back yard its territory, where it stays on the ground most all the time, just as a pheasant would. I still have seen no evidence of a mate. Beautiful! I wonder if the doves without mates tend to settle in a nice friendly yard and claim it as their own as I have 2 "loners" (one close to the house and another toward the back) that have been around for over 2 years. They come and go but mostly they settle down in the grass and hide for good parts of the day and night. They will eat with other birds but then return alone to their lonely place. I know they are there at night as I have frightened them so I no longer go near their "places" in the evening. I do not believe I have seen a dove quite like yours and I hope she (?) stays safe with you for a long while.